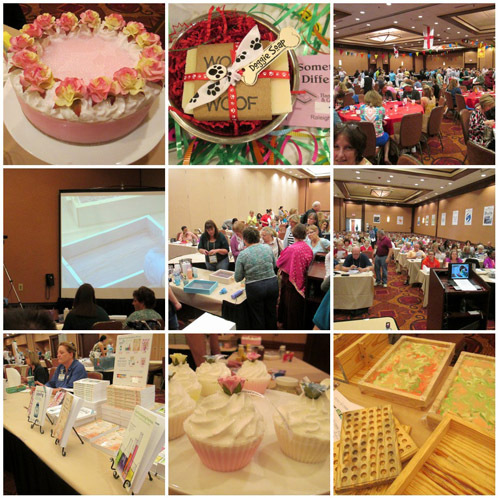 The 2013 Handcrafted Soap & Cosmetic Guild conference has come and gone, leaving more than 300 attendees overloaded with valuable lessons regarding all aspects of soap making and business practices. Tired? Yes! Inspired? I can hardly control myself. I could barely sit in my seat during Amanda Griffin’s peacock swirl demonstration. This is my third time attending and speaking at the conference, and it feels like they just get better each year. The classes were engaging and informative, the Soaper’s Showcase had the cream of the crop, and the goodie bags were generous to say the least. 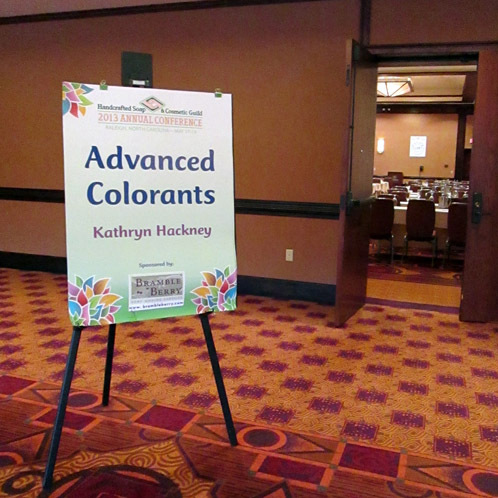 I had a great time talking about my favorite subject, color, in a Cold Process Colorant Master Class. You all had such great questions and I was thrilled to hear the sound of relief in so many voices who expressed their gratitude after the class. I also have to thank those who attended the second session and were fantastic sports when my mic went out part way through. It wouldn’t be as exciting unless there were at least some challenges along the way. Missed the conference? You can buy Kat’s Advanced Colorants e-book here! I met a few of my soap idols as well, including Sharon of Platypus Dreams (who came all the way from Australia!) and Marie Gale, author of Soap & Cosmetic Labeling, Good Manufacturing Practices, and 300 Years of Natural Recipes. We sat next to each other at lunch and talked about horses while I giggled like a fool. There was a game show night that had us all picking our brains trying to answer trivia, both soap related and general. Eh-hem, go Team Orange!! 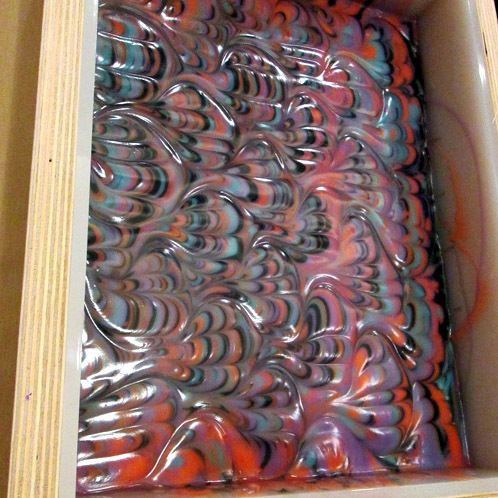 There was also an English carnival themed event with games like bocce ball, bean bag toss, and stack the soap molds. 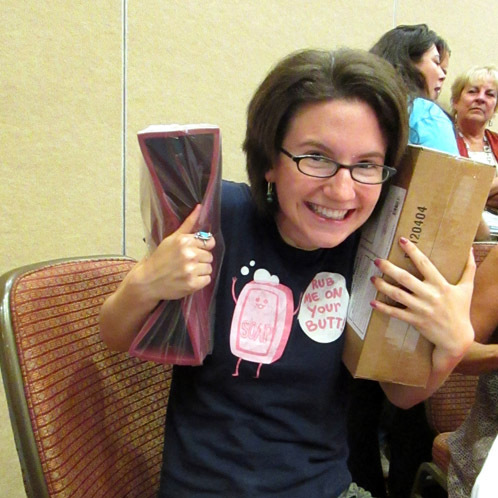 Everyone left with their arms full of prizes. The conference also has meals specifically designed in such a way where attendees get to network and meet fellow soapers from all over the nation and beyond. It’s a great opportunity to ask questions and converse with those who are doing exactly what you are, with all different experience levels and stories. I, for one, cannot wait to get back to my soap pot and put some new ideas into practice. Next year’s conference is being held at an incredible spa in Tucson, Arizona and early bird registration has begun. I have to thank the HSCG and all of the hard working coordinators who made this another successful and rewarding event. If you’ve never attended, I strongly encourage you to go. Split the cost of a room with some soap friends if it’ll help. You’ll never forget it!